Shidjiro was born as the 4the child in the family and the first boy. Being born as the only son in the family, expectations had been very high and I was supposed to follow my father’s footsteps as a Kuni shugenja from the day I wasborn. As my father had a high position at the emperors court he was kept from doing what the Kuni are born for , go behind the wall and root out the real evil. Never feeling at home in the court and also being looked down upon for being the son of a Kuni, Shidjiro grew up as a solitary young boy, always very dedicated to his training and when not reading scrolls about shadowland creatures and kuni techniques spent time exploring the feelds, mountains and woods surrounding the imperial castle. I followed the trail of blood his killers left and this trail led me to some Goblins who where proudly playing with shinga's dead body. In a blood rage I exterminated them all , for the first time casting my fire from within spell(a spell I had found in my father’s study), a spell that now came instictively to me. It became clear that I was a very driven young man who could also be verry stuborn when he felt that justice had not been surved. My family understood that life at court was making me very unhappy and I was sent to my Aunt in the city of Shiro Kuni. Being much closer to the wall and finally among people who did not despise the Kuni made me bloom to my full potential . However being away from my family , especially from my father who adored me, made it very hard to feel at home en this new but strangely dark city. But the fact that I got my first real teacher in the art of the shugenja compensated for the homesickness. This all changed when I met my teacher. An old blind man named Nisobu who was never seen laughing but was constantly cursing the gods for taking his eyesight so that he could no longer continue his studies of the power of crystals but needed to lower himself to teaching kids how to cast “useless” spells. As I did not want to let my father down I followed his harsh lessons until the day that news from the would came that changed my life. After my Father revealed Bayushi Kudan as the traitor and was assassinated by the scorpion clan, I did no longer feel the urge to pursue the path of the Shugenja but wanted become a full fledged witch hunter. This way I could maybe track down and exterminate the evil that led to the end of my father and become the one thing I knew my father always wanted to become himself. After my father’s death my mother started a well known Geisha House together with my Aunt and I got disgusted by the fact that man abuse woman in such ways. In later days only one man ( Hida Buruke) was ever able to make see the other side of the story , as he was the only man ever being honest about it, it became clear that this was needed to keep the balance in the true warrior in check. As even my sisters were not spared and became the best Geisha’s my mother had I started to look for a way out of this life. At that time there was the first attempt on my life and I was saved by a man who would become my all time hero, the great witch hunter named Shikehime. After finally finding a mentor witch hunter, I left my mother’s whorehouse. Shikehime did not waste any time and took me straight to the other side of the wall. After travelling for what seemed weeks (actually only 3 days) we arrived at a cave where he had made an outpost. He told me to look at the surroundings and memorize them, than he took out a rope bound my hands together with my Katana stuck in my hands blindfolded me and led me away. After an hour he took of the blindfolds and was gone. I tried to orientate myself but could not recognize any of the surroundings, I knew I had to het to higher grounds to get my locations right but that turned out to be a big mistake. From the moment I got to the top of a hilltop creepy sounds started to resonate across the barren lands. Luckily I did see the landmark I was looking for, a great old rotten tree that was near the cave and I started to run towards it … a second mistake. It didn’t take “them” long to catch up to me. My hands being bound I could not cast any spells so I had to fight them with my sword, in which I was not very well trained, but the dark rotten creatures kept on coming. Knowing that I was losing the fight my instincts came forward again casting a Katana of fire. This gave me an advantage for only a little time and after being overwhelmed the last thing I saw before fainting was a whirlwind of swords cutting limbs and heads all around me. The first month he trained me in only one thing … walking silently. The third month he trained me in speed and endurance letting me run for hours and making me catch bugs with chopsticks. The fourth month, midwinter I was trained in physical hardship having to survive the whole month wearing only trousers. The fifth month he trained my agility making me dodge and jump on impossible made courses. And the seventh month he thought me all about the surviving the shadowlands and the history of the Kuni. Then he told me to get back to the wall and start living like a true witch hunter. Coming back to the wall I thought it best to go to our Daimyo and present myself . And my way to the wall there was a second assassination attack from these foul insects the scorpions. This time however I was no longer defenseless and cut them all down. 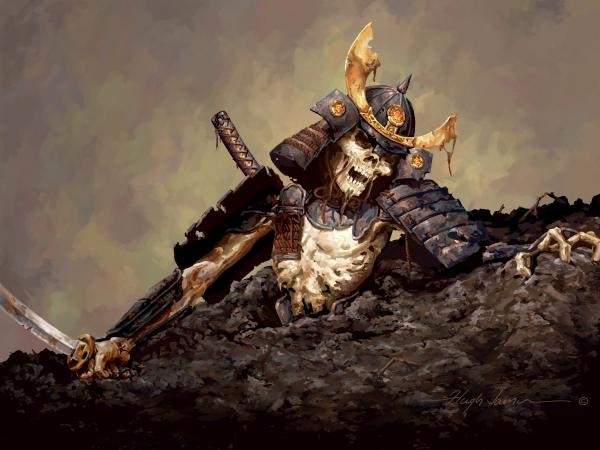 Before I could interrogate them they cats a spell which incinerated themselves, nothing Is more cowardly then a scorpion and one day the whole empire will see this even if I have to show this to the emperor himself. I traveled on to my destiny but fortune decided otherwise as I was dragged into a bar fight by a giant Hida who would become the first true friend I ever had….